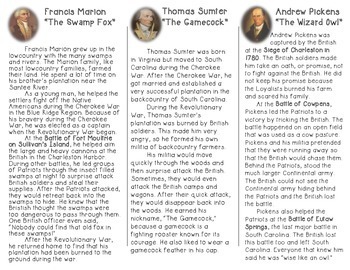 This is a brochure that I created to help teach the students about the three major SC heroes of the Revolutionary War. 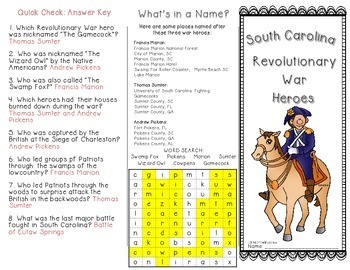 Information on Francis Marion, Andrew Pickens, and Thomas Sumter are presented in the brochure (and their nicknames) as well as a quick 8 question quiz and a fun word search. 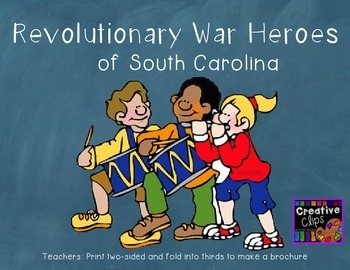 This would be great as a review before PASS, a partner reading activity, or as the main lesson after a great read aloud. 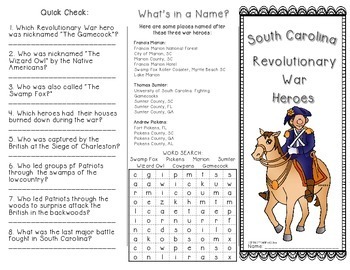 Please let me know if you have any suggestions to make this product better:) After we used this in class, my students created their own brochures by picking one hero and researching for more information (or they can create their own by using the information from the brochure if you are short on time).